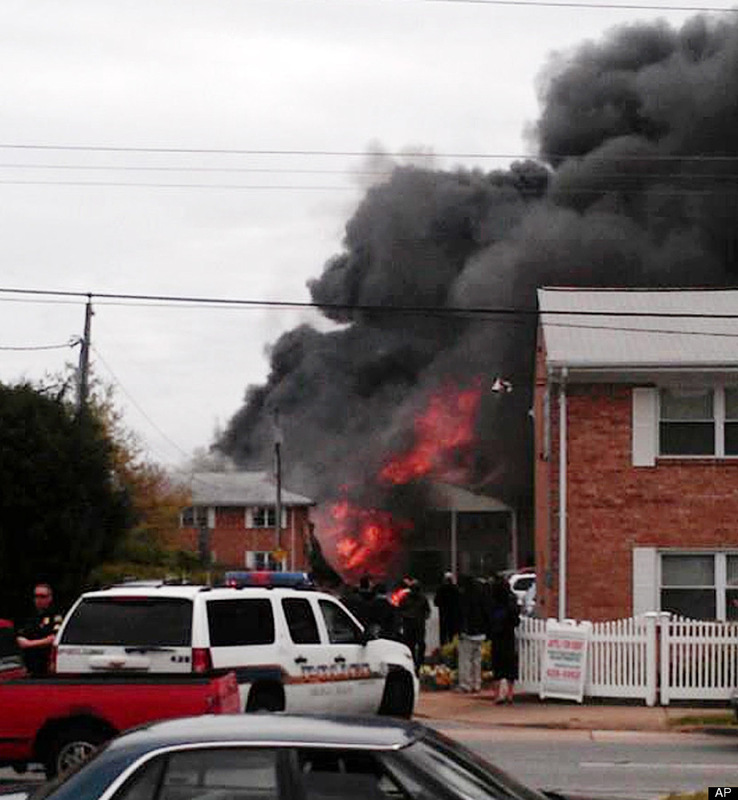 A U.S. Navy jet crashed into an apartment complex in Virginia Beach, Virginia, on Friday afternoon. CNN reports that the plane -- an F/A-18D assigned to Strike Fighter Squadron (VFA) 106 -- slammed into the Mayfair Mews Apartment complex, setting several apartments on fire. The US Navy reported that both pilots ejected from the plane, but are being transported to the local hospital for observation. SEE MORE VIDEOS on HuffPost here. VIRGINIA BEACH, Va. (NNS) -- An F/A-18D assigned to Strike Fighter Squadron (VFA) 106 crashed in Virginia Beach, Va. April 6. Initial reports indicate that at approximately 12:05 p.m., the jet crashed just after takeoff at a location just off of the base. Both aircrew safely ejected from the aircraft. VFA-106 is based at Naval Air Station Oceana, and serves as the East Coast Fleet Replacement Squadron. Their mission is to train Navy and Marine Corps F/A-18 Replacement Pilots and Weapon Systems Officers (WSOs) to support fleet commitments. The Navy is coordinating with local authorities. WAVY.com posted photos of the crash, which reportedly shut down traffic on I-264. WTKR NewsChannel 3, a CBS affiliate, also posted photos of the crash on Facebook. VIRGINIA BEACH, Va. — Two Navy pilots ejected from a fighter jet Friday, sending their unmanned plane careening into a Virginia Beach apartment complex and engulfing several buildings in flames. The plane had dumped loads of fuel before crashing, though it wasn't clear if that was because of a malfunction or an intentional maneuver by the pilots, said Capt. Mark Weisgerber with U.S. Fleet Forces Command. Seven people were injured, including both pilots, though all were expected to survive. Authorities were still combing through the wreckage of some 40 apartment units, and they said some residents of the complex still had not been accounted for. The pilots were a student and instructor, Weisgerber said. Bruce Nedelka, the Virginia Beach EMS division chief, said that witnesses saw fuel being dumped from the jet before it went down, and that fuel was found on buildings and vehicles in the area. The plane not having as much fuel on board "mitigated what could have been an absolute massive, massive fireball and fire," Nedelka said. "With all of that jet fuel dumped, it was much less than what it could have been." The crash happened in the Hampton Roads area, which has a large concentration of military bases, including Naval Station Norfolk, the largest naval base in the world. Naval Air Station Oceana, where the F/A-18D that crashed was assigned, is located in Virginia Beach. Dozens of police cars, fire trucks and other emergency vehicles filled the densely populated neighborhood where the plane crashed. Yellow fire hoses snaked through side streets as fire crews poured water on the charred rooftops of brick apartment houses. By late afternoon, the fire had been put out. Residents of the apartment complex described a confusing scene and an apologetic pilot. Colby Smith said his house started shaking and then the power went out, as he saw a red and orange blaze outside his window. He ran outside, where he saw billowing black smoke and then came upon the pilot as he ran to a friend's home. "I saw the parachute on the house and he was still connected to it, and he was laying on the ground with his face full of blood," Smith told WVEC-TV. "The pilot said, `I'm sorry for destroying your house.'" Smith said he and another man helped the pilot onto the street. Patrick Kavanaugh, who lives in the complex where the jet crashed, opened up his sliding glass door after hearing a loud explosion and saw one of the jet's pilots on the ground with blood on his face. Kavanaugh said the pilot, whom he described as a "young boy," was very upset and apologetic. "The poor guy was in shock. I checked for broken bones and opened wounds," said Kavanaugh, who spent 23 years in the rescue squad and retired in 1996. Despite having suffered several heart attacks and open-heart surgery, Kavanaugh said his old rescue skills kicked in as he dragged the pilot around the corner and away from the fire before several other explosions occurred. As authorities closed roads in the neighborhood, traffic backed up on side streets and on nearby Interstate 264, with slow-moving columns of vehicles bringing drivers to a virtual standstill early Friday afternoon. Edna Lukens, who works at the apartment complex across the street from the crash, said she saw three apartment buildings on fire. "We heard this loud noise and we looked out the window and there was smoke all in the sky. Then the flames started going up in the sky, and then the apartment building just started burning and the police was called and everybody came out," Lukens said. Felissa Ezell, 71, was sitting in a folding chair outside her townhouse near the crash site Friday and recalled hearing the crash as she returned home earlier in the day. "Oh, my God, I heard three really loud explosions, then the black smoke went up high in the sky," she said. The same model of fighter jet, an F/A-18D, crashed in December 2008 while returning to Marine Corps Air Station Miramar after a training exercise in a San Diego neighborhood. That crash killed four members of one family and destroyed two homes. The Marine Corps said the jet suffered a mechanical failure, but a series of bad decisions led the pilot – a student – to bypass a potentially safe landing at a coastal Navy base after his engine failed. The pilot ejected and told investigators he screamed in horror as he watched the jet plow into the neighborhood, incinerating two homes. A federal judge ordered the U.S. government to pay the family nearly $18 million in restitution. This is a breaking news update. Please stay tuned for details.